Danny Lipford and Chelsea Lipford Wolf host “Today’s Homeowner,” which airs nationwide and on The Rural Channel in Canada. MOBILE, AL (September 28, 2018) The top-rated syndicated U.S. home improvement television show, “Today’s Homeowner with Danny Lipford,” is expanding its broadcast network internationally. This season, the show will air on Canada’s specialty TV network, The Rural Channel, making it available to 1 million new viewers beginning Sept. 28. Founded in 2013, The Rural Channel (TRC) offers lifestyle and specialty programming to those living and working in rural areas of Canada. TRC is available via Shaw Direct satellite service, and is also carried by a growing number of cable firms throughout Canada. Show host and namesake, Danny Lipford, recently launched the 21st season of “Today’s Homeowner,” which boasts an impressive weekly audience of 1.9 million U.S. viewers. Airing in 207 U.S. television markets, the show broadcasts to 90% of the country, reaching 109 million households. With its new Canadian distribution, “Today’s Homeowner” will be available to an additional 1 million viewers. 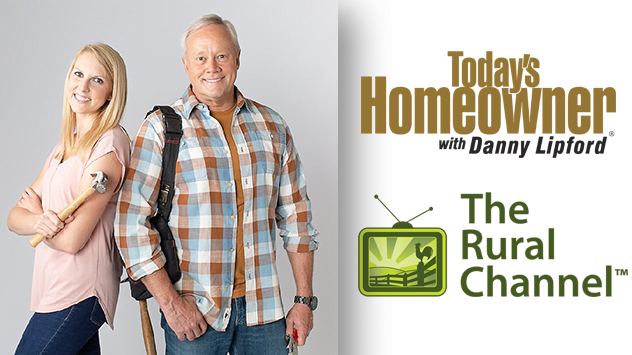 “Today’s Homeowner” will premiere on The Rural Channel Friday, Sept. 28, at 8 p.m. ET, which will be its regular broadcast time. The channel will offer additional airings of the show each week. The Rural Channel’s CEO, Bill Wilson, expressed interest in adding “Today’s Homeowner” to his lineup because of its straightforward and DIY approach to home improvement. This season on “Today’s Homeowner,” viewers can look forward to even more practical information they can put to use immediately. Episodes will include several customization projects for kitchens and baths along with a garage makeover, multipurpose room renovation and, of course, trendy outdoor living and curb appeal improvements. Viewers will be excited to know the show’s popular contests, “Curb Appeal Makeover” and “Win Danny and His Crew,” will also be a part of this season. Today’s Homeowner is a trusted home improvement authority delivering fresh, original, practical advice to consumers across diverse media platforms including the top-rated, nationally syndicated “Today’s Homeowner” television show, now in its 21st season, and its radio counterpart, the nationally syndicated “Today’s Homeowner” radio show.